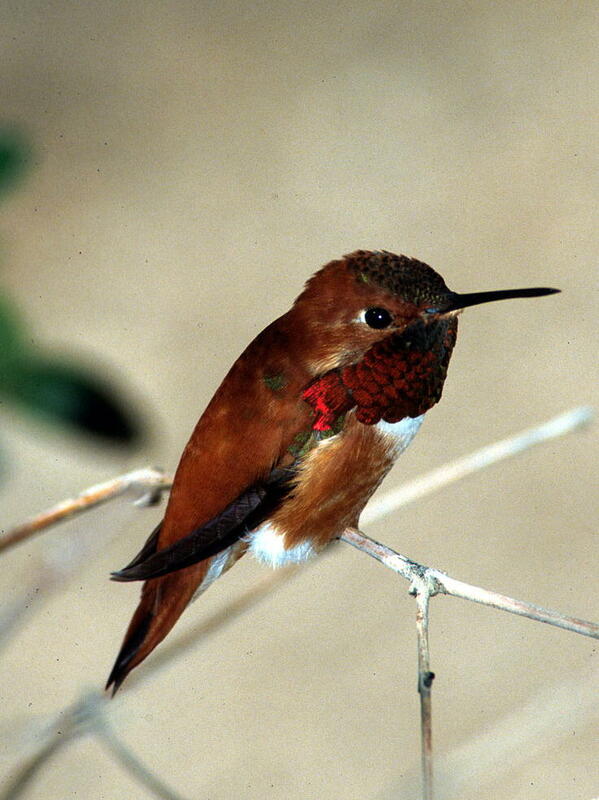 Rufous hummingbirds (Selasphorus rufus) travel from Mexico to Alaska and back, making the longest bird migration on earth as measured in body lengths. Habitat conversion and fragmentation threaten rufous hummingbird stopover sites along their migratory corridors. Knowledge of migration routing and timing is essential for insuring the persistence of this important pollinator and the pollination services it provides. We identified the locations of rufous hummingbird nectar corridors in northwestern Mexico based on floral distributions and hummingbird behaviors. There are three potential spring (northward) nectar corridors: Foothills Corridor, Plains of Sonora Corridor, and Gulf Coast Corridor. 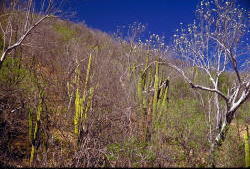 The Foothills Corridor is in tropical deciduous forest and foothills thornscrub between the Sonoran Desert and the Sierra Madre Occidental north almost to the United States border (30�20'N). 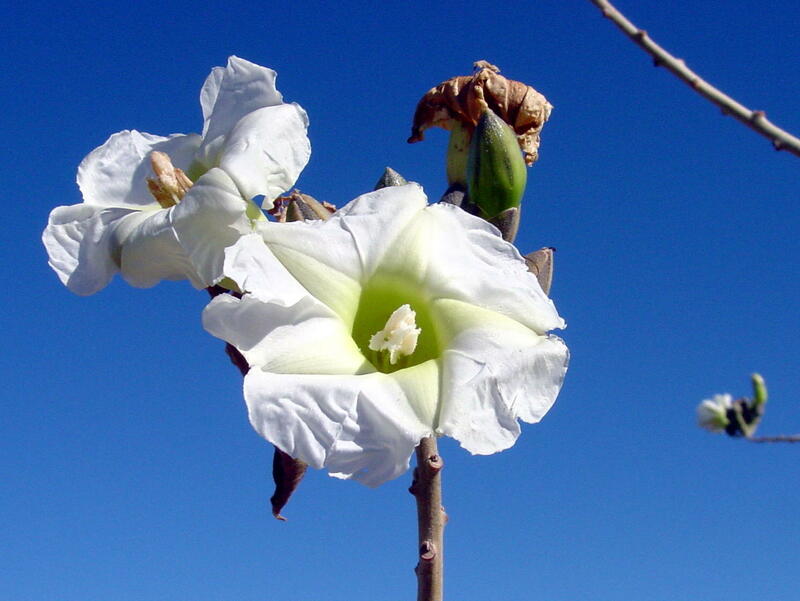 Tree morning glories (Ipomoea arborescens), tree ocotillos (Fouquieria macdougalii), and local patches of limita (Anisacanthus andersonii), rama del toro (Justicia candicans), and wild j�cama (Ipomoea bracteata) are important floral resources. The Plains of Sonora Corridor goes through the Sonoran Desert from Guaymas (27�30'N) through Hermosillo (29�05'N) to Santa Ana (30�30'N). 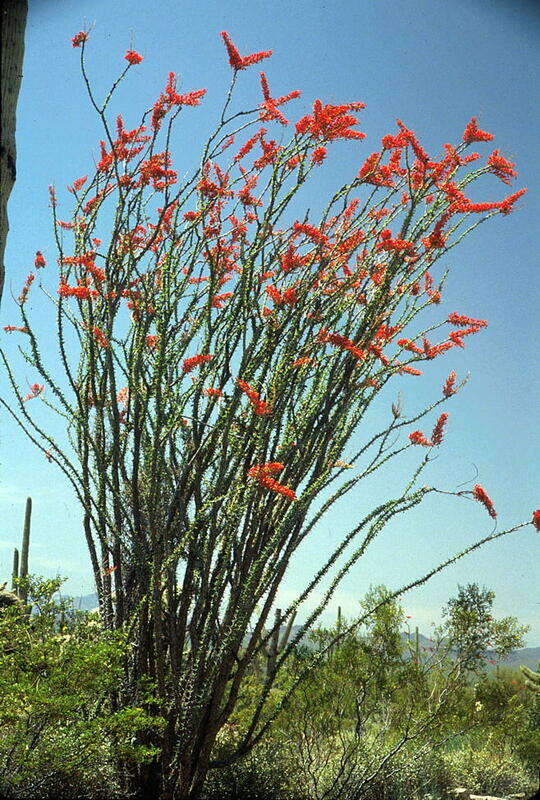 Floral resources are palo ad�n (Fouquieria diguetii), tree ocotillo, and ocotillos (Fouquieria splendens) on flats, and tree morning glories on desert ranges. The Gulf Coast Corridor follows the coast to northwestern Sonora, or crosses the Sea of Cortez to Baja California (ca. 29�58'N) using Tibur�n, San Esteban, San Lorenzo Sur, and Angel de la Guardia islands as stopovers. 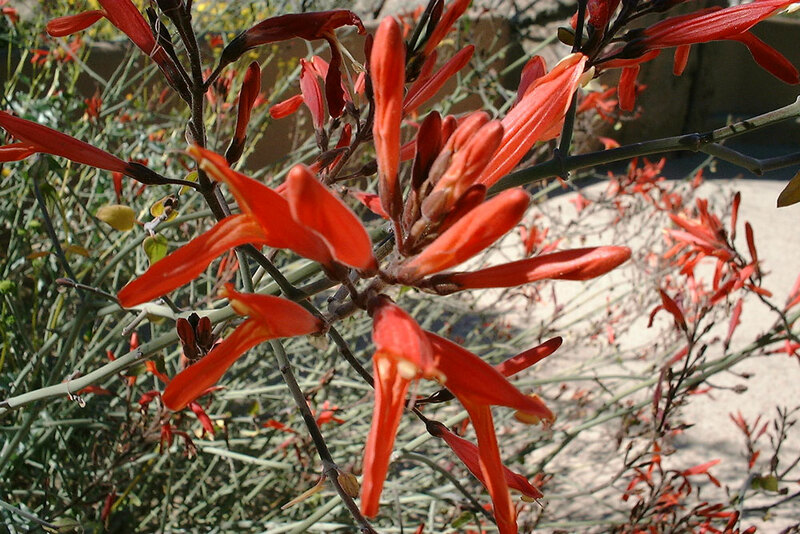 Palo ad�n, chuparrosa (Justicia californica), and ocotillo are important floral resources. 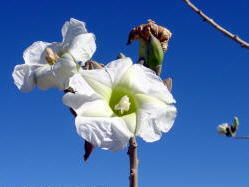 Tree morning glories and tree ocotillos, the largest of these species, are the most dependable floral resources, flowering every year. The relative importance of the three nectar corridors in the migration probably varies each year reflecting climatic conditions. Two main flyways are used for the southbound return to Mexico: Sierra Nevada and coastal range route and Rocky Mountain route. Fine scale corridor definition is not as obvious for the southward return within Mexico because flower resources within the corridor and the birds are more dispersed. 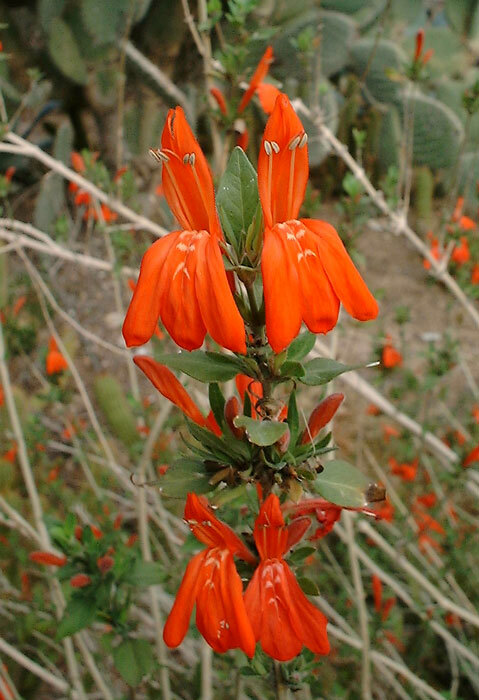 Except for the introduced tree tobacco (Nicotiana glauca), large patches of hummingbird-attracting flowers are found only in oak woodland and pine-oak forest in isolated 'sky island' mountains and the Sierra Madre Occidental above the lowland tropical and desert habitats. Rufous hummingbirds are known to fly along the Sierra Madre Occidental and Oriental at high elevations at this time of year. 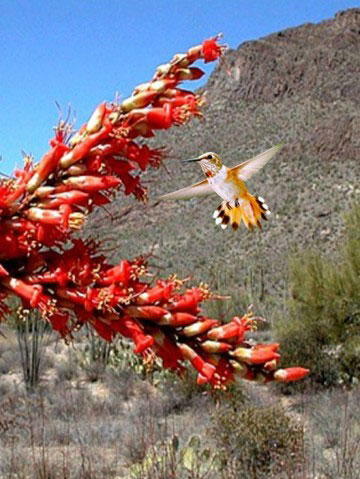 We also know that some rufous hummingbirds are traveling through the Sonoran Desert during the southern migration even though there are fewer large patches of hummingbird-attracting flowers in the Sonoran Desert than in adjacent uplands during this time. We do not know if they are moving from one mountain island to another or if they are relying on feeders and smaller patches of resources in the desert for refueling. Some of these migrators are using north-south riparian corridors while others have been observed traveling through open desert. Hummingbirds occur in the temperate and tropical regions of the New World, and several species migrate annually between the two regions. Although, their systematics are often revised, the most recent count was 328 species, qualifying them as the most species rich non-passerine bird family, the second largest bird family in the Western Hemisphere, and the most highly specialized nectar feeding, pollinating birds (Sibley and Monroe 1990, Johnsgard 1997, Schuchmann 1999). Hummingbirds play colorful and functionally important roles in pollination services. They serve as mobile links between plant populations in different landscapes, facilitating pollen and gene flow often over considerable distances. Many non-migratory pollinators visit these same flowers and benefit secondarily from genetic mixing stimulated by the migrants. Thus, hummingbirds are "keystone species," linking the fate of many other species scattered over large landscapes (Nabhan in press). endurance on that fuel (Calder in press). 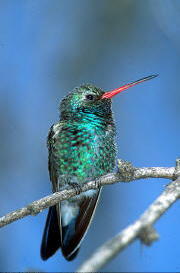 Therefore, hummingbirds must break long migrations into segments, with refueling stops en route. The numbers and species of hummingbirds present at any given site vary greatly with season as important nectar plants initiate or terminate flowering (Van Devender et al. in press). Rufous hummingbirds are North America's "extremist" hummingbird, known for their aggressiveness and traveling from as far south as the state of Jalisco (Mexico), to as far north as 61� North latitude, in Alaska. This is the longest migration measured in body lengths (~48,600,000 body lengths) of any bird (Calder in press). For a rufous hummingbird, 2.5 g of fat might sustain a flight distance of about 1095 km (650 miles) with no wind (Calder in press). Thus, a 4320 km breeding to wintering migration (southern Alaska to central Mexico) might require four flight segments with stopovers for refueling. More stopovers are required if headwinds are encountered or if nectar is in short supply. A transient hummingbird normally takes one to two weeks to replace the protein and fat metabolized on a completed flight segment. This extends the migration to four to eight weeks. When nectar availability is poor in drought years, the trip and time at refueling stops are prolonged. If there is no accessible food waiting at a stopover site, birds may die. Data from the National Audubon Society's Breeding Bird Survey suggest declines in some rufous hummingbird populations (Peterjohn et al. 1995, Muehter 1999). Rufous hummingbird nectar corridors, due to their great lengths, have many more opportunities for disruption from habitat degradation and fragmentation making this species particularly vulnerable. Habitat loss is especially precarious when the flight path crosses vast expanses such as the Sonoran Desert or the Gulf of California. 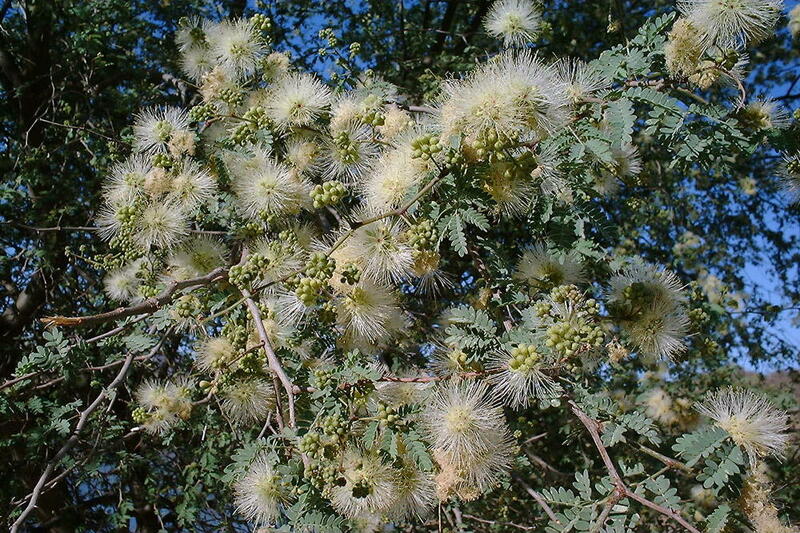 Over the last half-century, millions of hectares of desert and thornscrub vegetation in western Mexico and the southwestern U.S. have been converted to chemically intensive agriculture or to pastures of exotic grasses (e.g. African bufflegrass, Pennisetum ciliare). 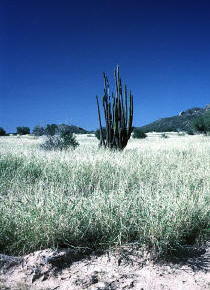 A nearly pure stand of buffel grass in Sonora. 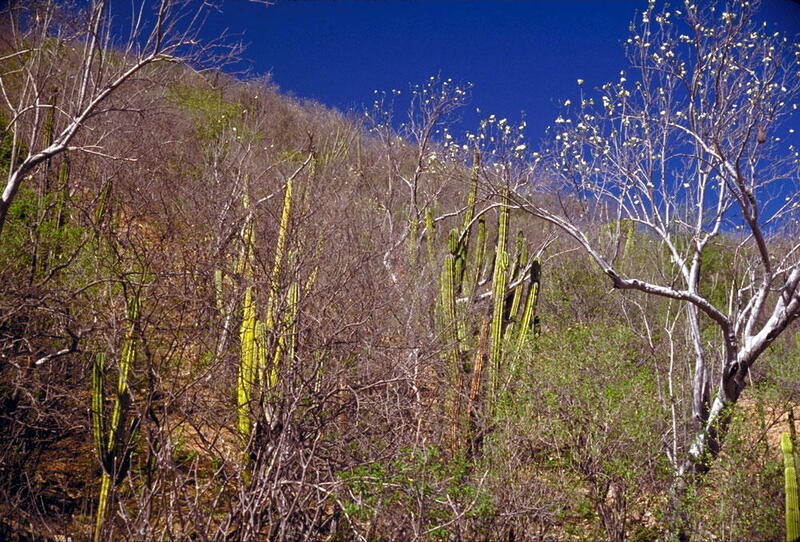 The organ pipe cactus has been burned and is dead. This has created 100-200 km stretches of flyways devoid of suitable forage for nectarivores (Nabhan 2001). Anthropogenic stresses combined with climatic variability can be disastrous for pollinators during migration. Knowledge of migration routing, timing, and energetics, as well as the population biology of hummingbirds is fundamental to insuring persistence and reliability of pollination services. Until now, little was known about the migration routes and strategies of regional populations of rufous hummingbirds. Migration patterns are not uniform from year to year. Migratory species must evolve to adjust to temporal and spatial changes in suitable stopover habitat. It is important to know what characteristics of these corridors, particularly if they are narrow, attract hummingbirds and how these characteristics change over time. This will allow us to define specific areas and resources for conservation efforts. 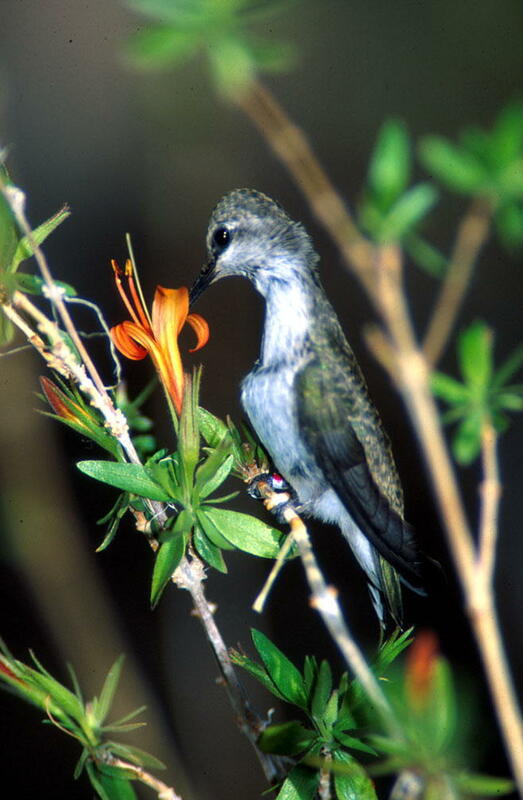 Our goal was to identify the locations of hummingbird nectar corridors running through northwestern Mexico to the United States on the basis of floral distributions and hummingbird observations. We made 936 observations (OBS) of 12 species of hummingbirds over the course of this study. Since individual observations ranged from one to 49 birds, the observations represent the simple presence of species and do not reflect relative abundances. The master database with 1,072 hummingbird observations from Canada, the U.S., and Mexico will be posted here in the near future. Numbers of observations are a rough estimate of the frequency of occurrence. Of the 83 species of plants we observed hummingbirds visiting, 70 have not been previously reported as hummingbird food plants in Sonora (Table 3). Additional species have previously been reported for a total of 98 species of known hummingbird-visited plants in Sonora (Table 3). Additionally, there are 33 other plants likely to be used by hummingbirds in Sonora based on feeding observations in the U.S. and other Mexican states (Table 4). These numbers illustrate the adaptability of hummingbirds to a diversity of species and floral syndromes. 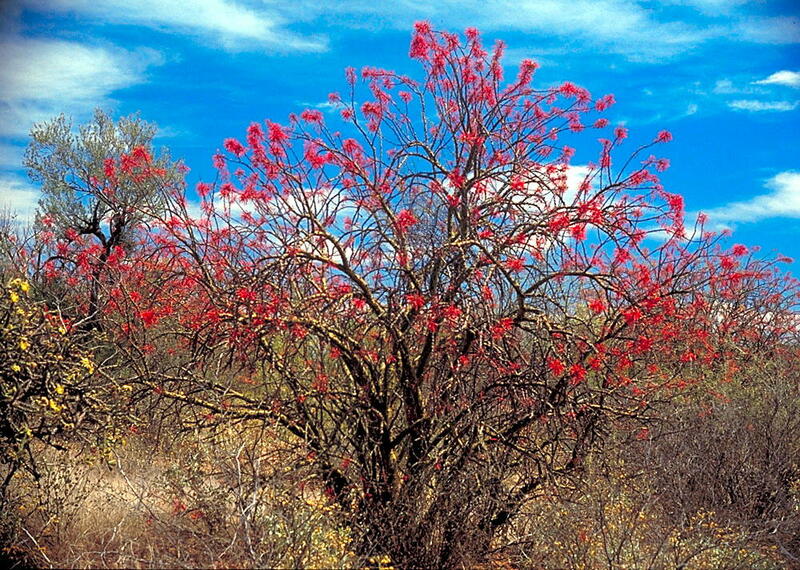 The most commonly visited plants observed in Sonora were tree ocotillo/ocotillo macho (75 OBS), tree tobacco/juanloco (42 OBS), pineapple sage (37 OBS), tree morning glory/palo santo (30 OBS), Texas betony (23 OBS), wild j�cama (23 OBS), limita (11 OBS), hierba del piojo (10 OBS), rama del toro/chuparrosa (7 OBS), Maycoba sage (Salvia betulaefolia; 6 OBS), ocotillo (6 OBS), and uvalama (Vitex mollis; 6 OBS; Table 5). 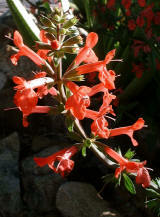 Of these 12 species of plants, only Texas betony, rama del toro, ocotillo, and tree tobacco have ranges extending into Arizona. Observations of hummingbirds by vegetation type and city in Sonora (Mexico) can be seen in Table 6. 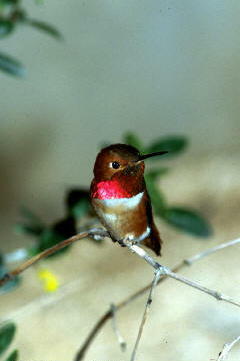 Rufous hummingbirds, specifically, are generalists in their feeding strategy. 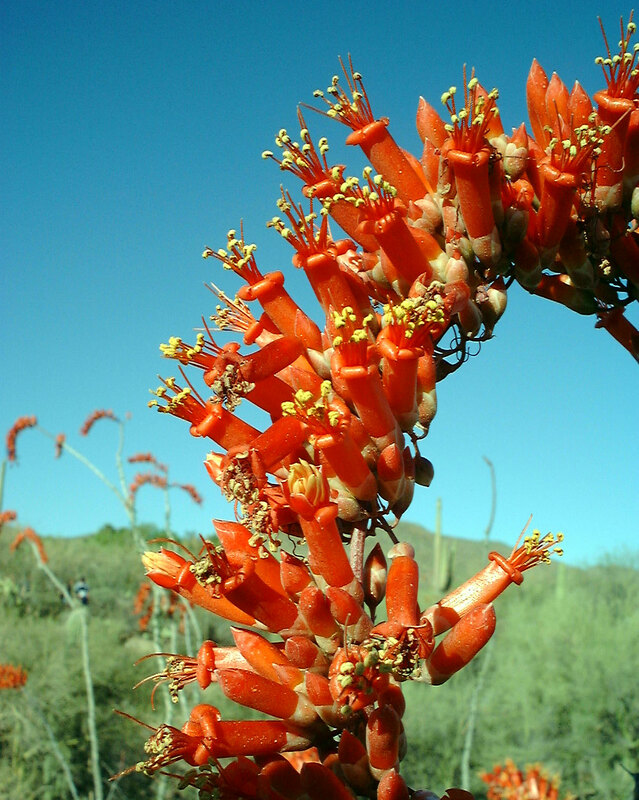 They were observed visiting 24 species of plants and have previously been observed feeding at the flowers of two columnar cactus species (Pachycereus pringlei and Carnegiea gigantea; Ted Fleming pers. comm. 2000, Francisco Molina pers. comm. 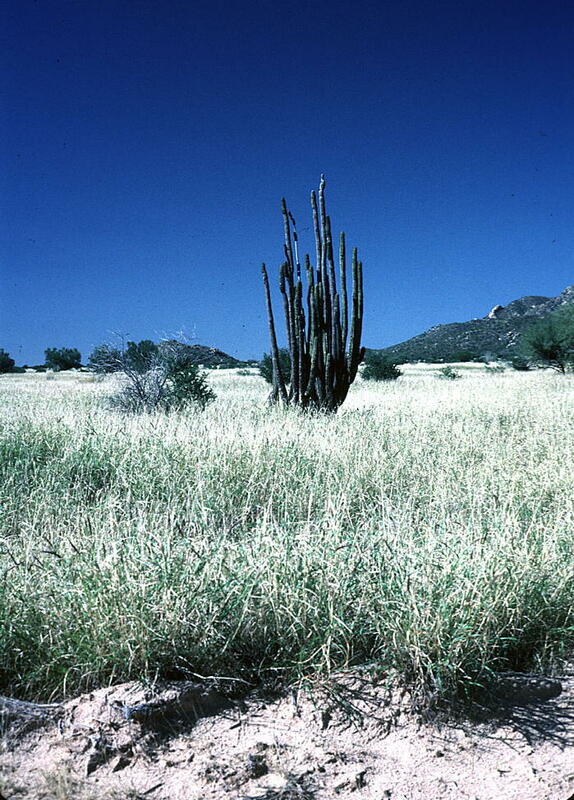 2001), chuparrosa and jackass clover (Wislizenia refracta) on the coast, Mohave beardtongue (Penstemon pseudospectabilis) in the Sierra Pinacate (Calder 1993), and mescal (Agave augustifolia) at Agualurca near Hermosillo (Francisco Molina F., pers. comm., 2001). 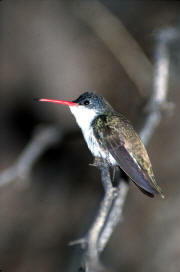 Rufous hummingbirds have thus been observed feeding at flowers of a total of 30 plants in Sonora (Table 7) Only the resident broad-billed hummingbird (Cyanthus latirostris) visited more plants (46 species). 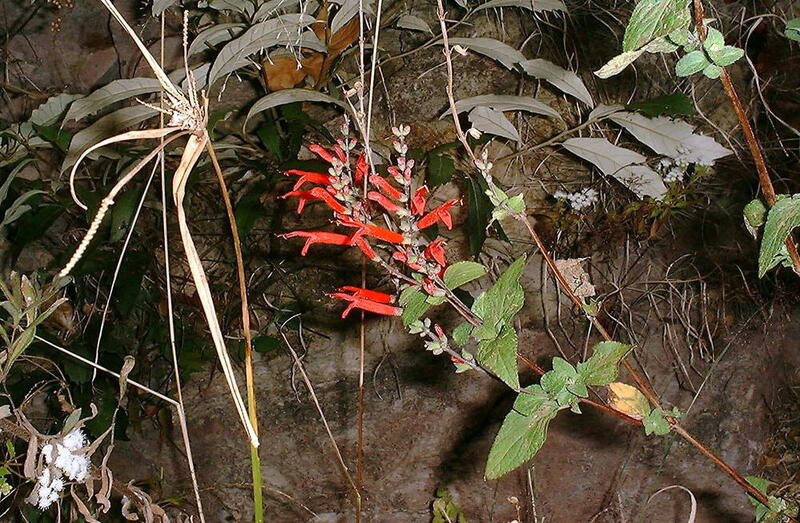 With the exception of chuparrosa, ocotillo (See Calder 1993) and tree tobacco (Russell and Monson 1998), the plants that we observed rufous hummingbirds visiting are new floral resource records for rufous in Sonora. 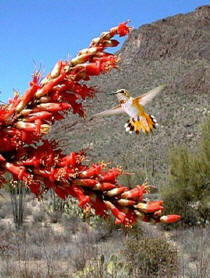 The flowers of the 22 native plants visited by rufous hummingbirds were red (54.5%), yellow (22.7%), white (13.6%), and purple (9.1%) indicating that they forage beyond floral choices representing the classic hummingbird flower syndrome. Rufous hummingbirds are associated with a flower color distribution similar to that of the 43 species of native plants in Sonora visited by all hummingbirds: 'reddish' (orange, red, pink, salmon, magenta; 55.8%), yellow (16.3%), white (14.0%), and lavender-purple (11.6%). 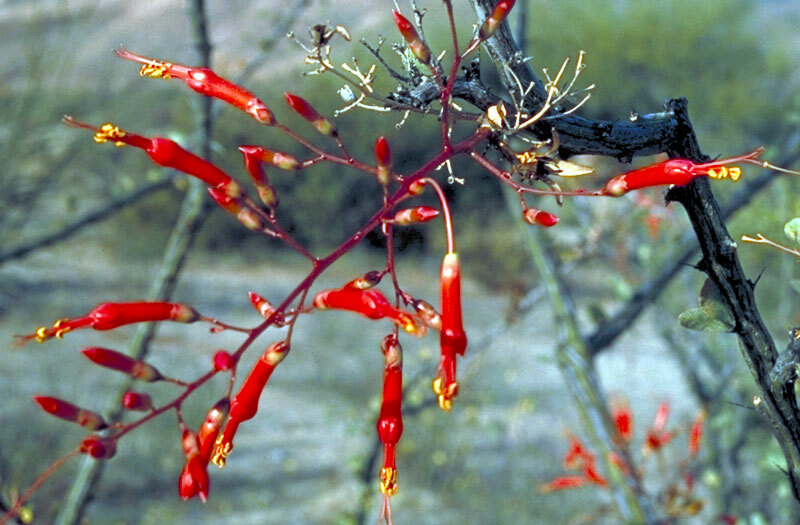 With the major exceptions of hierba del piojo (yellow flowers), tree morning glory (white flowers), and wild j�cama (purple flowers), most of the large patches of plants frequented by hummingbirds in Sonora have red flowers. We observed rufous as well as broad-billed, Costa's (Calypte costae), and violet-crowned (Amazilia violiceps) hummingbirds, bees, flies, and a monarch butterfly (Danaus plexippus) visiting the flowers of palo chino along the R�o Yaqui near T�nichi, the flowers of this species are tiny white cups aggregated into dense heads. 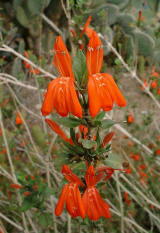 In mimosoid legumes such as palo chino (Havardia mexicana) and many others, it is often difficult to see if hummingbirds are feeding on nectar or insects attracted to the flowers.